To compute the various physical and chemical parameters of a protein. To perform primary structure analysis of proteins. To introduce a protein analysis software that is available through the ExPASy server. 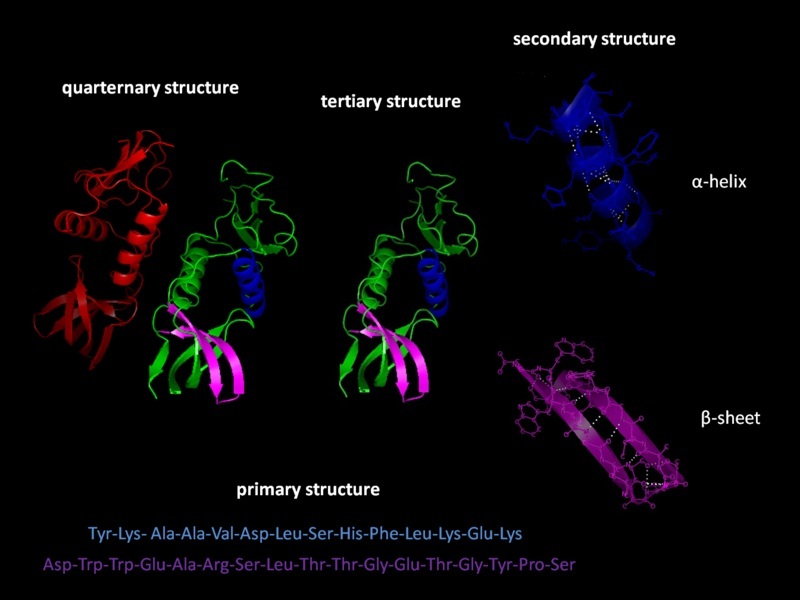 A pictorial representation of primary, secondary, tertiary and quaternary structure is shown in figure 1. There are different tools available through ExPasy server to analyze a protein sequence. ExPASy is the SIB Bioinformatics Resource Portal. It provides access to several scientific databases and software tools in many areas of life sciences including proteomics, genomics, phylogeny, systems biology, population genetics, transcriptomics etc. ProtParam is one among the protein analysis tool available on the ExPasy server and can be accessible through the link, http://www.expasy.org/tools/protparam.html. It is used for calculating various physiochemical parameters of a provided protein. The protein sequence is the only input provided to calculate such parameters. The protein can either be specified as a UniProtKB/Swiss-Prot or UniProtKB/TrEMBL accession number or ID or as sequences of amino acids. The various parameters computed by ProtParam are molecular weight, amino acid composition, extinction coefficient, estimated half-life, theoretical pI, and grand average of hydropathicity (GRAVY), aliphatic index and instability index. In protParam, the molecular weight of protein is calculated by the addition of average isotopic masses of amino acids in the provided protein and the average isotopic mass of one water molecule. Protein pI is calculated using pKa values of amino acids. The pKa value of Amino acids depends on its side chain. It has an important role in defining the pH dependent characteristics of a protein. The half-life is a prediction of the time it takes for half of the amount of protein in a cell to disappear after its synthesis in the cell. The GRAVY value for a protein or a peptide is calculated by adding the hydropathy values (Kyte, J. and Doolittle, R.F., 1982) of each amino acid residues and dividing by the number of residues in the sequence or length of the sequence. Increasing positive score indicates a greater hydrophobicity. The aliphatic index of a protein is described as the relative volume occupied by the amino acids such as alanine, valine, isoleucine and leucine, which have an aliphatic side chain in their structure. The aliphatic index of a protein is calculated according to the following formula (Ikai, A.J., 1980). Where X(Ala), X(Val), X(Ile), and X(Leu) are mole percent (100 X mole fraction) of alanine, valine, isoleucine, and leucine. The coefficients ‘a’ and ‘b’ are the relative volume of valine side chain (a = 2.9) and of Leu/Ile side chains (b = 3.9) to the side chain of alanine. The instability index provides an estimate of the stability of your protein in a test tube. A protein whose instability index is smaller than 40 is predicted as stable, a value above 40 predicts that the protein may be unstable. This experiment uses the Protparam tool, available through the ExPASy server: SIB bioinformatics resource portal.